I rescued this book from my mother's christmas garage sale. She was going to sell this little treasure for $.50! Every year, I set a box out full of Christmas books, DVDs, and Advent supplies. The kids can pull out items throughout the month as they prepare to celebrate. All our belongings are still packed away in my in-laws garage so this may not happen this year. 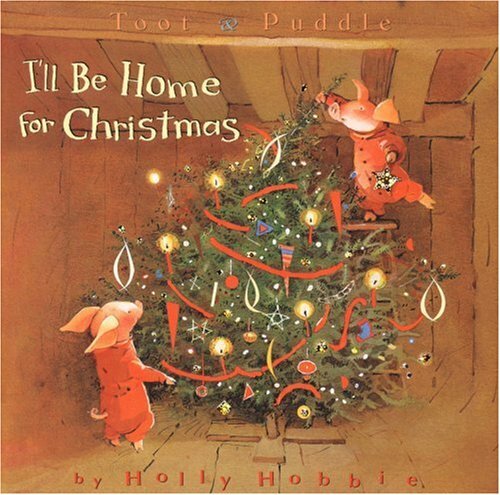 Thanks to my mom's garage sale, though, the kids will have one fantastic Christmas book to look at, Toot & Puddle's I'll be home for Christmas. Toot & Puddle are a sweet little pair of pigs that live in some hippie dippie place called Woodcock Pocket. Their home is quaint and cozy and full of love. I love their character and relationship, but what I absolutely LOVE about this book is the pictures. I love them because they are LOVELY. Holly Hobbie, the auther and illustrator, is also an artist. If her paintings look anything like her picture books, I would totally hang them on my walls. Is it possible to love the books you read to your kids? It is. I have a Holly Hobbie quilt in my attic from my childhood. Love it! I did not know she was an author, too! Derek & Amanda are engaged!